Paris St-Germain striker Zlatan Ibrahimovic has been ruled out of Tuesday's Champions League quarter-final second leg against Chelsea. The 32-year-old was substituted after injuring his thigh 68 minutes into Wednesday's 3-1 first-leg win in Paris. 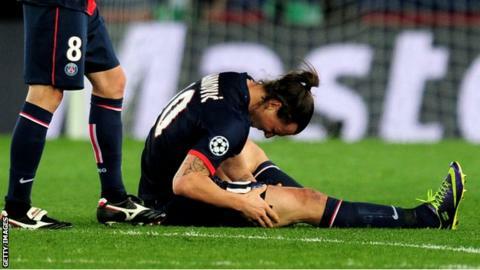 Coach Laurent Blanc said: "Ibrahimovic has a muscle injury. It's a blow." Blanc expects the Sweden international, who has scored 35 goals for PSG so far this season, to be fit before the end of the campaign. Speaking on Thursday, PSG president Nasser Al Khelaifi said the forward would be out for at least a month. Edinson Cavani is likely to move up front to replace the Swede with Lucas Moura, who came on for him on Tuesday, coming in on the wing. Ibrahimovic has scored 10 goals in the Champions League so far this season, including four in the 5-0 win over Anderlecht in October. Chelsea boss Jose Mourinho, who managed him at Inter Milan, described the former Barcelona forward as "one of the best players" he has ever coached.